IMF chief Christine Lagarde was placed under formal investigation by French magistrates yesterday for her alleged role in a long-running political fraud case, a source close to the former French finance minister said. 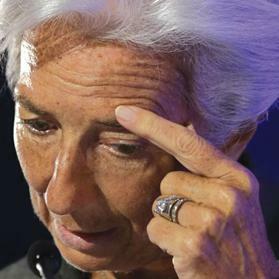 The source said Lagarde, who earlier was questioned by magistrates in Paris under her existing status as a witness, considered their decision to investigate her for alleged “negligence” was unfounded and would appeal it. A French judiciary source also confirmed the step. In France, magistrates place some­one under formal investigation when they believe there are indications of wrongdoing, but that does not always lead to a trial. The inquiry into tycoon Bernard Tapie has embroiled several of former president Nicolas Sarkozy’s cabinet members including Lagarde. Tapie – who supported Sarkozy in the last two elections – was awarded €403 million in a 2008 arbitration payment under Sarkozy’s presidency to settle a dispute with the now defunct, state-owned bank Credit Lyonnais over a 1993 share sale. Lagarde was finance minister at the time.